This morning I saw EHX mention a demo video of their Electro-Harmonix Micro POG by JJ. This is the second video I’ve seen by JJ demo’ing pedals, and I have to say he does a great job of both demonstrating what the pedal can do as well as explaining the controls and techniques in a very simple way. The POG is a great pedal, I actually own a POG2, and one can totally get lost creating some interesting sounds with it. The Micro POG is the POG2 but scaled down. Having only 3 knobs makes options quicker and easier to get to. JJ also uses some EHX Cathedral Stereo Reverb which works well with the POG. If you’re interested in the Electro-Harmonix Micro POG, I found a nice deal at Amazon. 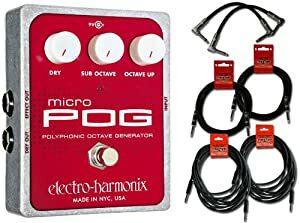 Currently, you can pick up the EHX Micro POG for $212.74 at Amazon, but it comes with a few bonus items (I’m a fan of the bundle). With this purchases you get 2 6″ Patch Cables, 2 10′ Instrument Cables and 2 18.6′ Instrument Cables. So a total of 6 cables!